In my 2012 Formula 1 Season Preview I concluded with some unanswered questions about the season ahead. 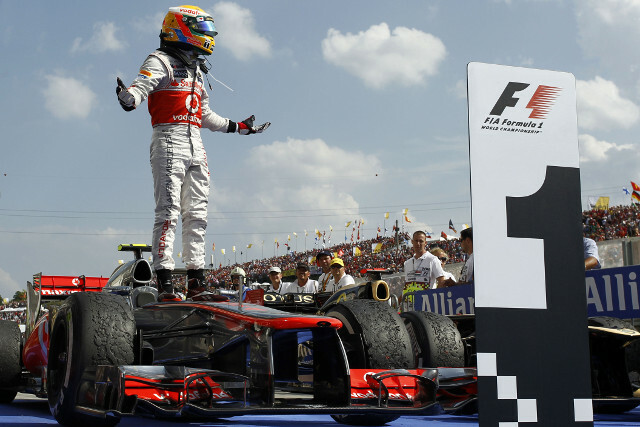 Now 11 races into the season and the teams enjoying a mid-season break, it's a good time to take stock of the season so far and predict who could take the 2012 Driver's and Constructor's Championships. If there's one thing to be certain of, it's that this season has been one of the closest fought and exciting ever with 7 different race winners! Surprisingly, Ferrari driver Fernando Alonso sits atop of the Driver's Championship on 164 points with the most race wins so far this season: 3. Ferrari started the year clearly with a slower car than their rivals but, coupled with some luck, Alonso has the Prancing Horse half a length ahead at the mid-season break being the only driver to score points at every race so far. If he can keep his lead, Alonso would take his third world title, which would surely be the greatest of his career. However, Ferrari counterpart Felipe Massa has had a disastrous start to the year scoring only 25 points that places Ferrari fourth in the overall Constructor's Championship and is most certainly going to be replaced for 2013. Red Bull sit top of the Constructor's Championship on 264 points due to consistent performances from both drivers. Mark Webber sits second, 40 points behind Alonso, with Sebastian Vettel a mere 2 points behind in third. As predicted, the clarification of certain rules regarding exhaust-blown diffusers and flexible front wings has eliminated Red Bull's dominance but that still hasn't stopped them 'interpreting' the rules a little different to others regarding engine mapping. If Red Bull win either Championship this year, Christian Horner will have his drivers to thank. Should Vettel take the Driver's crown, he will cement his position as one of the sport's all time greats. McLaren sit second 53 points behind Red Bull; drivers Lewis Hamilton and Jensen Button sit in fourth and seventh, 47 and 88 points behind Alonso respectively. The team got off to a promising start with consistent podium finishes but results began to evade them and they were in danger of the wheels falling off, literally, being hampered by pit-stop woes and set-up issues. However, strong results in the last 2 races before the break look promising and could be the resurgence to the top. Probably the biggest surprise of the year so far is the success of Lotus and their drivers. They lie third 1 point behind McLaren, with Kimi Raikkonen fifth 1 point behind Hamilton and Romain Grosjean eighth tied on points with Button. Undoubtedly the fastest car in the pack for raw pace, it is only a matter of time before former world champion Raikkonen gets his maiden 2012 victory with Grosjean proving the ideal wingman. Mercedes round out the top 5, but a lack of raw pace sees them way behind, 140 points off championship leaders Red Bull. Nico Rosberg tasted long overdue victory in China, as well as second in Monaco, but these prove the only highlights of their 2012 show reel. The infamous Michael Schumacher should be much higher than 12th in the Driver's Championship with a podium finish and pole position in Monaco. However, consistent finishes in the points have eluded him due to reliability issues. There is light at the end of the tunnel though, as his driving so far this season looks set to prolong his second F1 inning for at least another year. Sauber, Williams and Force India are in a league of their own with each looking to be top of the mid-field come the season end. All these drivers have had moments of brilliance, punching above their weight, as well as moments to forget. Most notably Williams' driver Pastor Maldonado who took victory in Spain but aggressive style has seen him sat outside the Principal's office in detention. Makes you wonder if they made the right decision releasing Rubens Barrichello at the end of last season? In Finland they have a saying, "to finish first, first you must be Finnish". I'm sure Raikkonen will be hoping this holds true, but I can't see it happening. A sterling effort none the less in his second coming. I think Alonso's luck has ran out and he will tumble from the top. In a season so close, it takes the grit and determination of a Raging Bull to win a title, not the finesse of a Prancing Horse. In my heart I'd like McLaren to take both titles but in all honesty I think they'd take either at this point. I'm backing Hamilton in the Driver's Championship as I think he revels in this type of dogfight, but Red Bull to take the Constructor's Championship due to the consistency of both man and machine.